This love affair started in the spring of 2007, when I was part of a team that made a movie in and around Penticton and Kelowna. 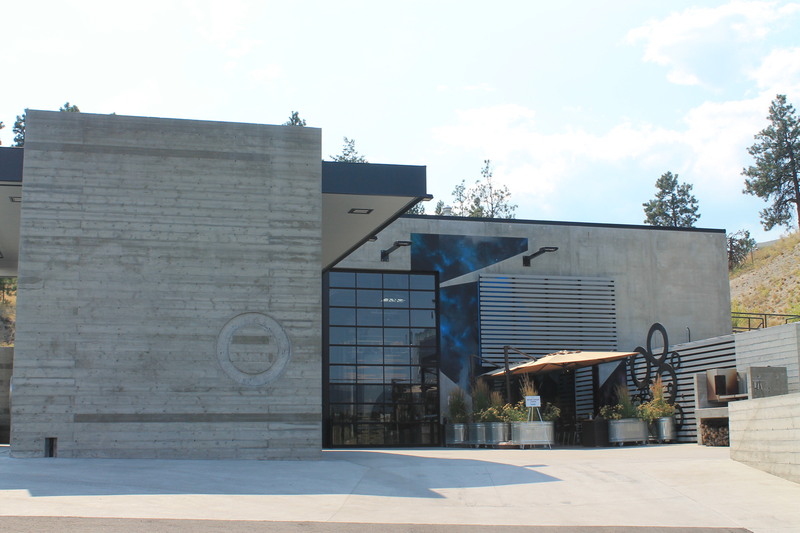 I’ve managed to return almost every summer since, and it’s always been a treat–visiting old loves (see: Raudz in Kelowna), and discovering new ones (like Liquidity Winery last summer). There is nothing not to like about Lake Country. The weather is beautiful; sunny and hot. There are gorgeous, pristine beaches on fresh water lakes. There are wineries everywhere. And there is an abundance of fresh produce. Those things all add up to making it one of my absolute favourite holiday destinations. Now, I’ve spent quite a bit of time in and around Kelowna, Kamloops and Penticton/Naramata/Okanagan Falls/Oliver. But I had only been to Vernon once, a couple summers back, to visit my friend Kazia, who lives there. Last weekend, though, I got to see a whole other side of Vernon–one I had no idea existed. You see, Vernon is not a huge town. With a population of about 50K, it still really has that “small town” feeling. 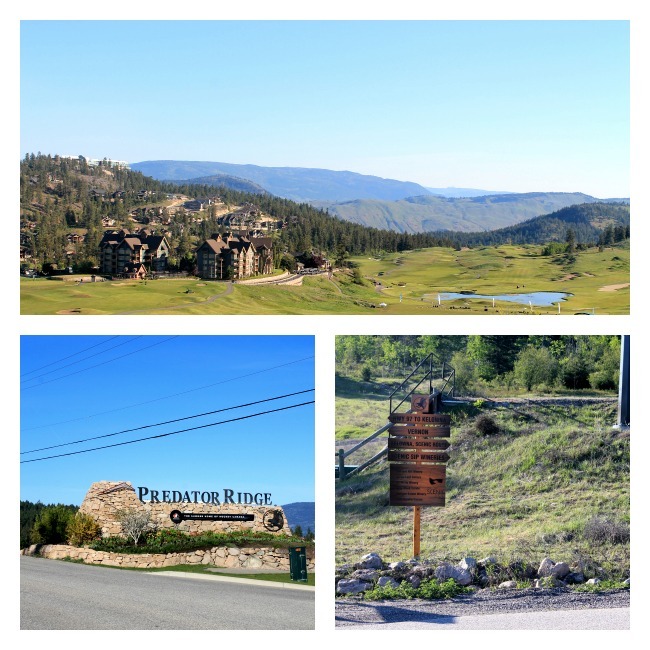 But hidden in this “small town” is are two world-class resorts: Predator Ridge and Sparkling Hill (which I will write about in the future). 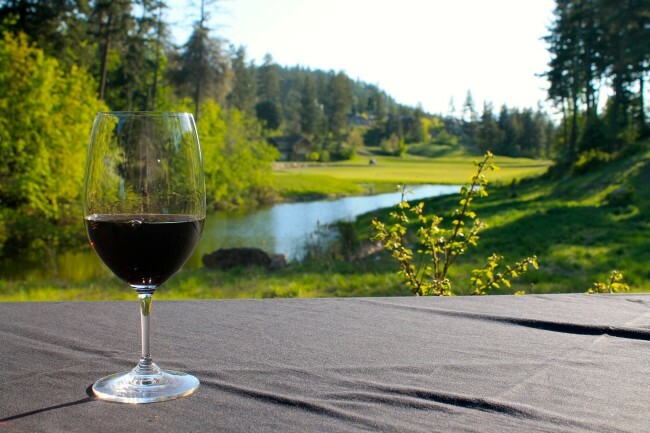 Predator Ridge opened in 1991, but the current owners acquired it in 2007. Bridging over 4 acres of land, it includes two golf courses, a hotel, vacation homes, a fitness centre and pool, and out door pool, and several restaurants. 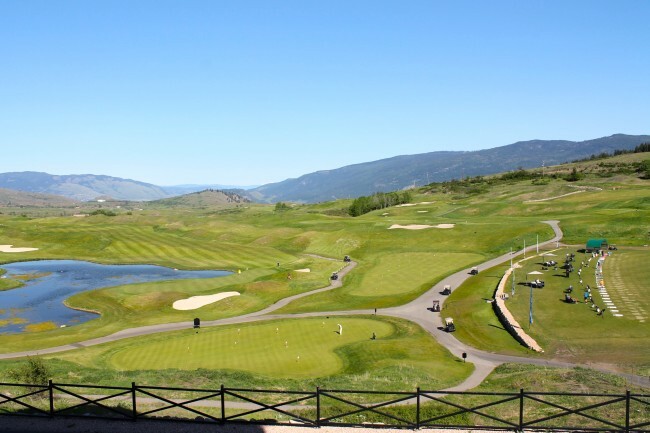 It’s located just outside of Vernon–the town itself is about a 10 minute drive away. It is tucked up in the hills, making 4 acres seem very private and remote, even though you aren’t really that far away. I was in a 1-bedroom suite. I’ve written extensively about this in the past, but I love staying in a proper suite with door on the bedroom. I didn’t have Michael with me this time (I really want to go back with him, though! ), but it really is a bonus when you can put your kid to bed, and have a door to close so you can watch TV in the living room. There was also a full kitchen (which I did not have time to take advantage of), a fireplace, and a huge deck, looking out over the golf course. My favourite part, though? The bathroom. 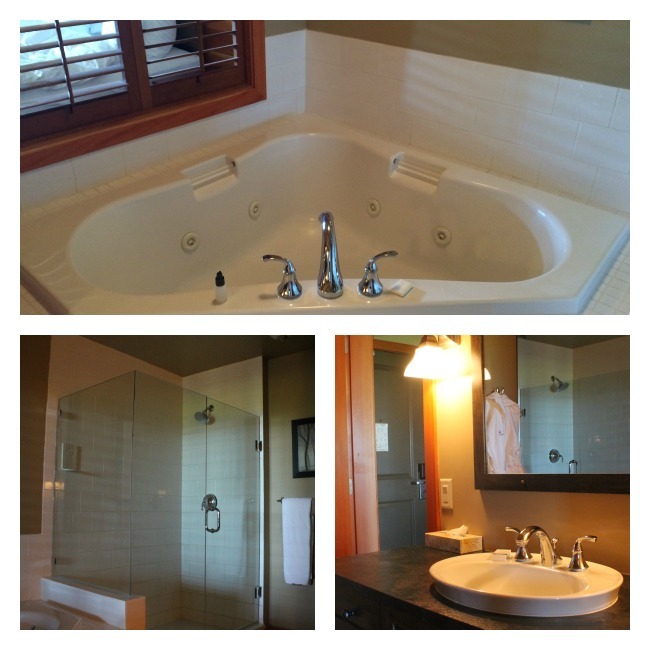 Check out the massive soaker tub with jets, which has a louvered window, so you can look out over the golf course from the bath. Beyond a few games of mini-golf with my son every summer, I’ve never been golfing before. Ever! I know, seems hard to believe, but it’s just never been something that I had an opportunity to do. Predator Ridge is one of the best golf courses in Canada, and they have, on staff, professional golfers (AJ Eathorne and Brodie Carle) to coach you. 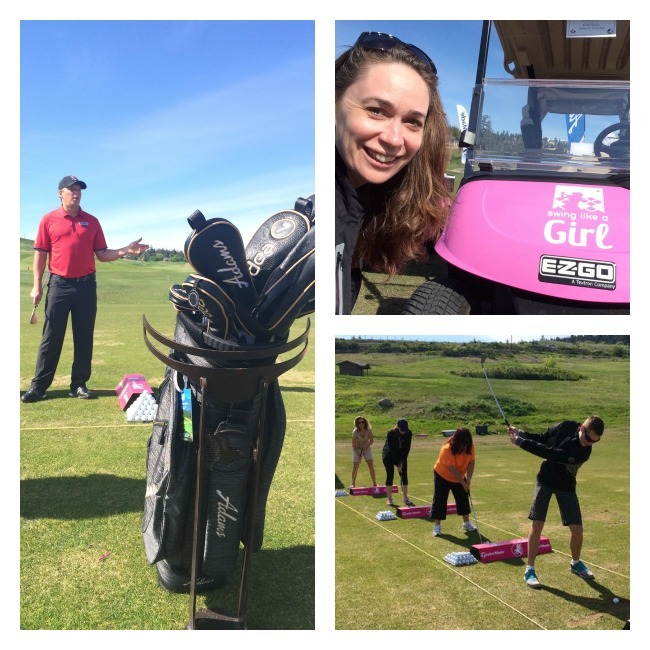 They even have this whole Swing Like a Girl program to appeal to female golfers. So, it doesn’t matter if you don’t know how to golf–this is the place to learn. 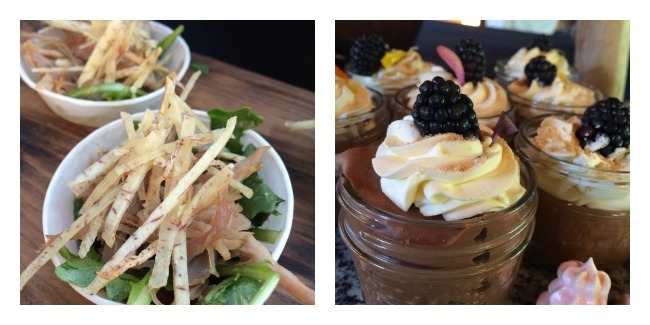 Duck confit salad with yucca chips, chocolate pots du creme (I ate 2. Of both). When I was a kid, I had a rule, and my son has the same rule: we have to stay in a place with a pool. The end. There are two here to choose from: an indoor pool for laps (there’s an alcove for fun, too), which also includes a large hot tub and a deck for sunning yourself, and an outdoor pool, as well, for hot sunny summer days. There is a huge fitness centre that looks out over the pool, and they offer yoga up in the woods, as well. You can also rent bikes and hit the nearby trails. 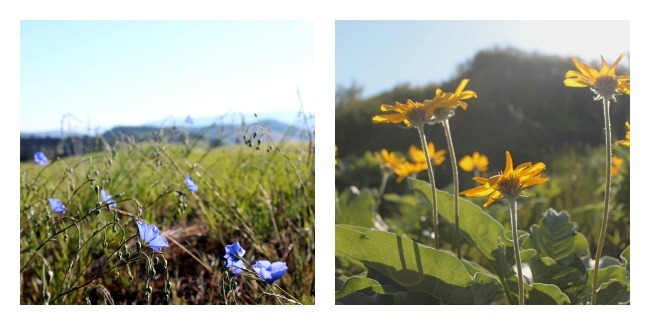 The only thing they don’t have here is a spa, but that’s okay, because perhaps the best, European-inspired, wellness spa in the world is only a few minutes drive away at Sparkling Hills (and there are shuttles). 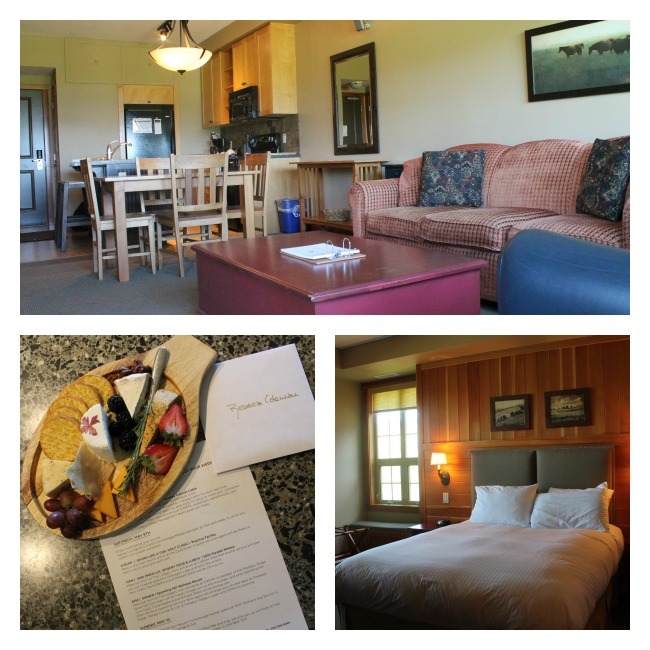 Predator Ridge would be a great spot for a girlfriend’s getaway weekend, or a special anniversary celebration with your sweetie (especially if one or both of you like to golf). It would also be a great vacation spot with your kids (I really want to return with Michael). There is no way you can come here and not relax. Not leave feeling restored. And that feeling is priceless. Last week, I talked about my fave donut places in Vancouver. 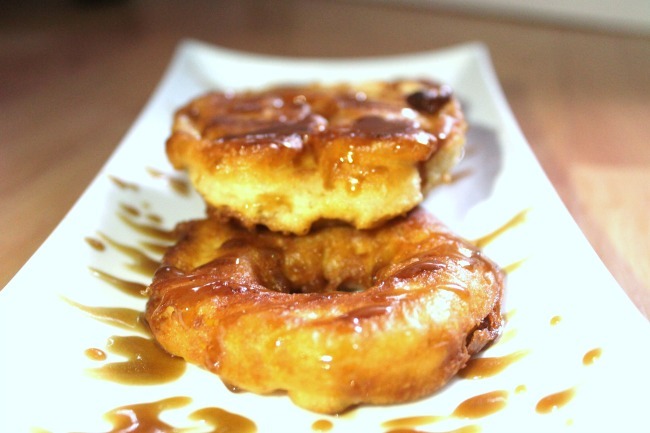 If you’re a big donut fan, though, you can also make them at home. I got these cool Donut Pans from Amazon that I use to bake donuts all the time. These donuts, though, are donuts of a different kind. A few years back, I was in Penticton to speak at the very first Eat, Drink, Tweet Conference. One night, after the learnin’ was done, we all headed over to Summerland, a short drive out of Pentiction, along the road that leads to Kelowna. We all had dinner at at place called Local Lounge. I’ve been back to Local a few times since then, and the food has always been astonishing. They use local, fresh ingredients, and the result is magical. For dessert that night, I had something I’d never even considered before: an apple donut. Now, this wasn’t a round-shaped pastry with some chopped apple inside. This was an actual apple, cut into a ring, battered, and deep-fried. Well, it was a bit of an eye-opener. The apple is cooked enough so that it’s warm and juicy, but not cooked so much that it’s mushy. There is that warm, crispy outer coating, only enhanced, in this case, by a dusting of sugar and cinnamon. You really need to serve these warm, straight from the pan. They would be amazing with a little ice cream and caramel sauce on the side. By the way, I recently entered a contest put on by the BC Ambrosia Apples people. They are giving away a fantastic trip to the Okanagan, which includes a three-night stay in Summerland at the Summerland Waterfront Resort, a $100 gift certificate towards any service at the spa, a gift certificate for $100 at Local Lounge (so you can try their apple donuts for yourself), an Okanagan Crush Pad VIP wine tour and tasting, and $500 spending money. 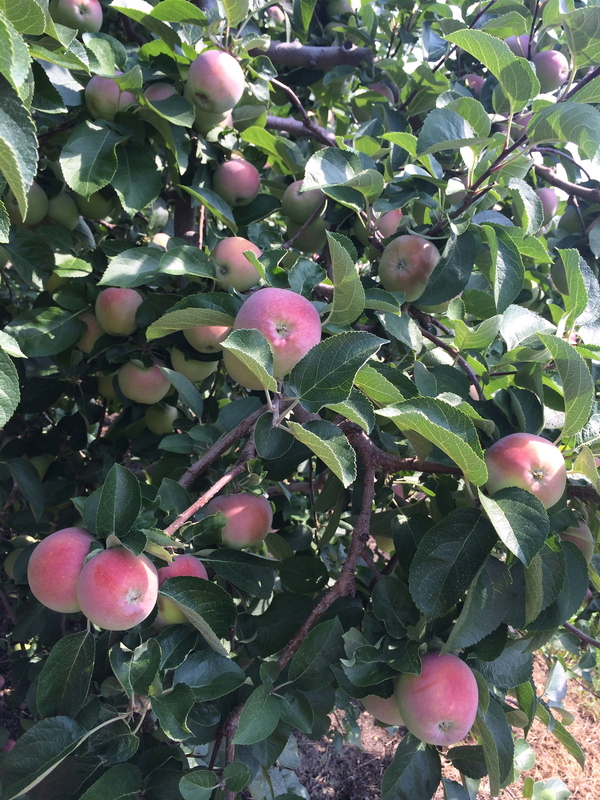 You just need to take a picture of how you enjoy your BC Ambrosia apples, and submit it here. I hope I win, but if I don’t, I hope YOU win! Okay. Now for the recipe. By the way, this is based on a traditional Dutch donut, that is normally served on New Years Eve, called Appelflappen. Cut the apples into rings, about 1/4-1/2 inch thick. You can leave the peels on. 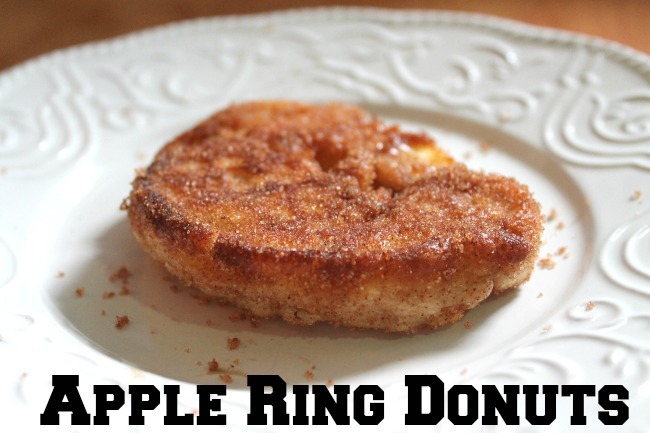 Using a small, round cookie cutter or apple corer, cut out the core of the apple, making a donut-shaped ring. In a large, flat-bottomed bowl, combine the dry ingredients. In separate bowl, beat the wet ingredients together. Add the wet to the dry, and stir until combined. In a heavy, flat-bottomed pot or frying pan (I used my cast iron), heat about 1/2″ of a neutral oil, like sunflower or vegetable. Coconut would also work. When the oil is shimmering and hot (you can test it if you like, with a little drop of batter), dip the apple slices into the batter, then pick them up with a fork and allow the excess to drip off. Carefully place them in the hot oil, away from you. Allow them to cook for about 3 minutes, until golden, and then flip and cook them on the other side. Meanwhile, put the sugar/cinnamon mixture in a brown paper bag. Take the donuts out of the hot pan, and drop them immediately into the cinnamon/sugar mixture, and shake the bag well to coat. Allow to cool slightly, and then eat them right away! They are no good left over.